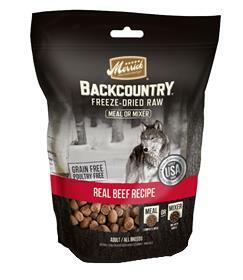 Freeze-dried bites of meat provide a nutritional raw boost in a convenient and safe format for dogs to enjoy. They can be served as a complete and balanced meal on their own, as a mixer added to kibble, or served as a treat. Ingredients:Deboned Beef, Beef Liver, Dried Potatoes, Gelatin, Potato Protein, Beef Broth, Dried Kelp, Mixed Tocopherols (a preservative), Apples, Carrots, Blueberries, Potassium Chloride, Minerals (Zinc Amino Acid Complex, Iron Amino Acid Complex, Potassium Chloride, Copper Amino Acid Complex, Manganese Amino Acid Complex, Sodium Selenite, Calcium Iodate), Vitamins (Vitamin E Supplement, Vitamin A Supplement, Niacin, Thiamine Mononitrate, d-Calcium Pantothenate, Riboflavin Supplement, Vitamin D3 Supplement, Pyridoxine Hydrochloride, Vitamin B12 Supplement, Folic Acid), Choline Chloride.